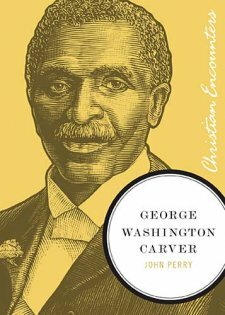 George Washington Carver, written by John Perry, is a great closer look at one of America’s foremost scientists. This book walks us through Carver’s life, from his difficult childhood to his success at the Tuskegee Institute. It also brings to life the specific struggles which Carver faced during his life. I enjoyed reading this biography, but would have appreciated a closer look at such an interesting man. George Washington Carver had a very difficult childhood. His mother, a slave, was captured in Missouri during the Civil War, and never recovered. Her baby boy, George, was recovered by his master for the price of a fine racehorse. After the war, George remained with his former owners: the Carvers. Childhood problems of weakness and breathing made him unfit for hard farm work, thus he remained inside more, and from an early age became fascinated with biology. Carver as a young man is a portrait of an intensely dedicated and industrious young man working towards obtaining his education. He faced many challenges, partly due to his physical difficulties, but also simply because of the color of his skin. Eventually he was accepted at Iowa Agricultural Institute, and after graduating, accepted a position at the Tuskegee Institute, an all-black school led by Booker T. Washington. There, Carver had many of his discoveries, such as the myriad uses of sweet potatoes and peanuts. One fact I appreciated about the book was that it clearly painted his difficult relationship with Booker T. Washington, the school’s principal. Carver was still grieved when this great spokesman for African-American rights passed on. What I found most remarkable about this man was his patient approach to all the discrimination he faced. Very unlike the protests of Malcolm X and the boisterous 60s, Carver’s approach was rather to prove to the world that an African-American scientist could be in every way as successful as one of any other color. I found it interesting that Carver was very interested in the accolades of others, and threatened to resign many times from the Tuskegee Institute when he felt he was not getting enough recognition or funding. His popularity with students was another interesting fact: during his professor-ship Carver wrote hundreds of letters to students of the Institute, in a way becoming their father, so to speak. It was also clear, upon reading this book, how much Carver appreciated the world as God’s Creation, and worshipped God in his own way of collecting and analyzing the natural world. He taught students how to see God’s amazing craftsmanship in the world around us. Overall, George Washington Carver by John Perry is a good book, but a little too short for my tastes. Clocking in at 130 pages, it basically only piqued my interest in learning more about one of United States’ greatest scientists. I would have appreciated a slightly longer look which drilled in more deeply towards Carver’s feelings and goals. Still, for a short read, this biography isn’t bad: I recommend it. Sounds good. I haven’t read much about Carver, but it looks like this book would be an ideal place to start. Is there another book that you know of that examines Carver’s life in more detail? I do not know of a book that examines his life in more detail, unfortunately. I’d like to look for one though; this one made me interested in Carver.